With a single species Hygrobia hermanni (Fabricius, 1775), the Screech Beetle, considered to be common across southern England and the midlands becoming much rarer further north. Adults may be found around the margin of still water, usually where the bottom is soft silt or mud and often where the water is ammoniacal from the attention of cattle. 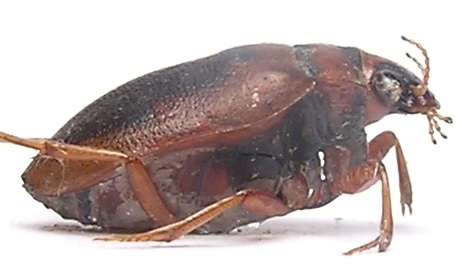 It's inclusion on the Watford list is based on a single specimen from Radlett road lakes during June 2006 taken from silt among emergent vegetation. During the 1980's the species was common along the Colne valley south of Watford, especially so from the barren edges of reservoirs, usually occurring in groups of up to twenty during the warm summer months. As soon as vegetation began to shade the water the beetles vanished. Recent (2004) sampling of its former habitats failed to find the species. Although we cannot comment on whether it is declining we cannot but be surprised at its scarcity. 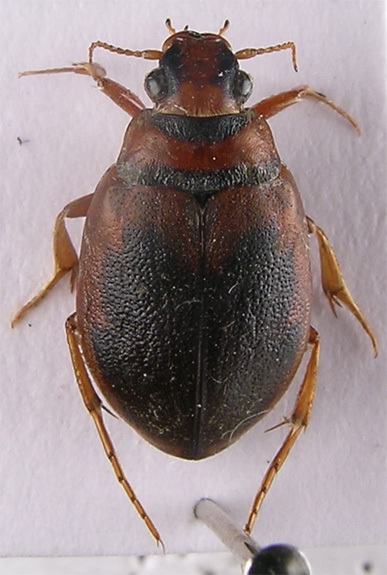 Adults have commonly been referred to as the Screech Beetle from their habit of stridulating loudly when alarmed. The sound is produced when the sharp edge of the 7th abdominal tergite is rubbed against a subapical median file on the elytral undersurface. The Hygrobiidae are characterised by the presence of an antecoxal sclerite, a small transverse scleroticised plate lying between the posterior edge of the metasternum and the post coxal processes. 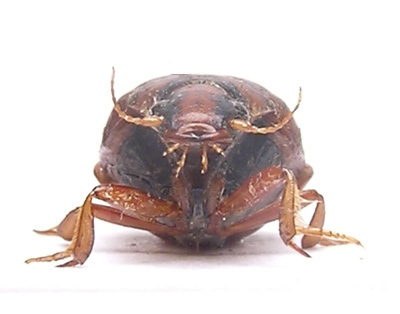 In practical terms distinguished from other water beetles by the structure of the head; produced in front of the eyes and narrower than the anterior margin of the pronotum, and the elytra lacking striae. 8.5-10mm. Brown, appendages lighter. Head laterally, anterior and posterior margins of pronotum and majority of elytra dark grey or black. Eyes convex and prominent. Entire upper surface punctate; head and thorax finely so, elytra very coarsely so posteriorly from a weak transverse depression in front of middle. Undersurface very convex.